"First class customer service from start to finish. Thank you." Demonstrator Model (Mileage subject to change) Mazda 6 Touer Fitted with Sports Alloys, Heated Front Seats, Touch Screen Media system with Sat Nav, Connections for Bluetooth, USB and AUX, BOSE Sound System, Full Electric Windows, Remote Central Locking, Front and Rear Parking Sensors, Rear View Camera, Automatic Wipers and Lights, Auto Air conditioning, Cruise Control with Speed Limiter, Steering Controls, Power Folding Mirrors, Heads up Display. Demonstrator vehicle, dealer owned and maintained. This car is in stock at Maidstone Suzuki, Honda and Mazda. Mazda 2 comes with standard specification including Bluetooth system, Mobile App interface, Smart City Brake Support - SCBS, Cruise control, Hill hold assist, 7inch touch screen, 6 speakers, Auxiliary input socket, Isofix child seat attachment and much more! This car is in stock at Bolton Motor Park Abarth, Fiat and Mazda. Ask about our unique Warranty4Life with comprehensive AA cover on qualifying vehicles. 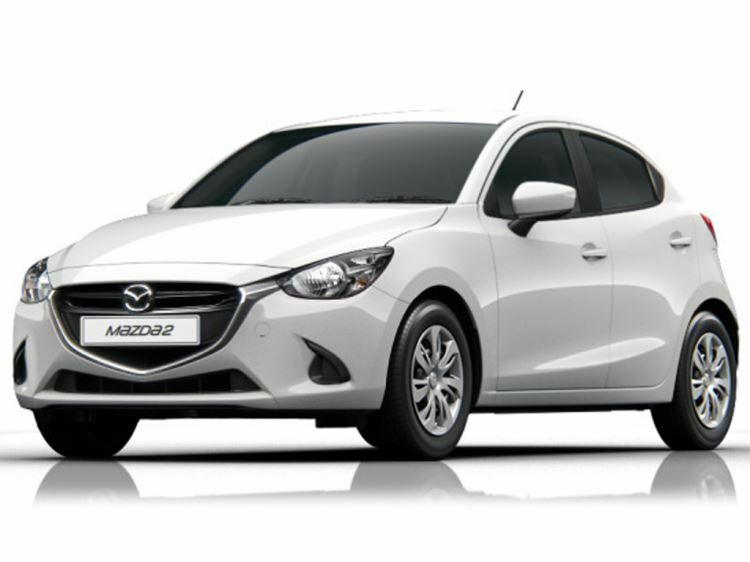 Mazda 2 SE-L Nav fitted with Alloy Wheels, Bluetooth Phone Connection, Cruise Control, Engine start/stop button, Electric Windows, Air Conditioning, Remote central locking, CD/Radio, Touch screen media system, with Sat Nav, Auxiliary AUX and USB input. Finished in 'Arctic White' Paint and 15inch Steel Wheels our Mazda 2 comes with specification including Hill hold assist, Daytime running lights, Steering wheel mounted audio controls, USB/iPod/auxiliary input connections, Radio/CD and mp3 compatibility, Trip computer, Body colour electric adjustable door mirrors, Rear roof spoiler, Body colour bumpers, Isofix system on outer rear seats and much more! This car is in stock at Mazda Northampton Motors. Our neat hatchback comes with up to 60.1 mpg, excellent mileage for its age and qualifies for Warranty 4 Life! Get in touch today. Mazda 2 Sports Nav Fitted with - Touch Screen Media system with Sat Nav, Connections for Bluetooth, USB and AUX, Front and Rear Electric Windows, Rear Parking Sensors, Air conditioning, Cruise Control with Speed Limiter, Sport Alloy Wheels, Steering Controls, Power Folding Mirrors. Finished in 'Snowflake White Pearl' Paint and 15inch Alloy Wheels our Mazda 2 comes with specification including Lane departure warning system, Cruise control, Adjustable speed limiter, Bluetooth hands free telephone connection, Hill hold assist, Smart City Brake Support - SCBS, 7inch touchscreen with multimedia commander and Aha and Stitcher app, Bluetooth audio streaming, DAB Digital radio, USB/iPod/auxiliary input connections, Daytime running lights, Isofix system on outer rear seats and much more! Our neat hatchback comes with great features, has up to 62.8 mpg, low mileage and qualifies for Warranty 4 Life! Mazda 2 SE-L fitted with Engine start/stop button, Key Less Start, Electric Windows, Air Conditioning, Remote central locking, Alloy Wheels, CD/Radio, Integrated Bluetooth, Auxiliary (AUX) and USB inputs, ISOFIX child seat anchorages, Thatcham Category Accredited Alarm and Immobiliser System. With Mazda Digital Service History and recently serviced at end of March! Our Mazda2 is packed with great kit including cruise control, lane keeping aid and bluetooth. Mazda 2 SE-L fitted with Alloy Wheels, Touch Screen Media system with Sat Nav, Bluetooth Phone Connection, Cruise Control,Engine start/stop button, Electric Windows, Air Conditioning, Remote central locking, CD/Radio, Auxiliary (AUX) and USB input, ISOFIX child seat anchorages, Thatcham Category Accredited Alarm and Immobiliser System, Tyre Pressure Monitoring System, Heated, Auto power-folding door mirrors. Designed without compromise, this little car is stylish and agile, boasting Kodo design and a playful spirit.